I ran a Patreon poll about theory-oriented posts, and this option won over the concepts of skin in the game and of cities and assimilation. It came to me when I tried understanding why on several distinct measures of good governance related to urbanism and public transportation, the US is unusually weak by developed-country standards. I was reminded of something regular commenter Max Wyss once said: in French and in German, there’s a word that means “the state” and has positive connotation, whereas in native English use it usually refers to a sinister external imposition. My main theory is that the US has problems with governance that ultimately stem from its racist history, and these have unrelated implications today that lead to poor urban governance and low transit usage. This is not a straightforward claim about white flight leading to high car use, or even a general claim about racism-poor transit correlation. (I don’t think the US is currently more racist than the average Western European country, and the costs in Europe don’t seem to correlate with my perception of racism levels.) In particular, fixing racism is not by itself going to lead to better transit or better urbanism, only to improvements in quality of government that in the future could prevent similar problems with other aspects of public policy that are yet unforeseen today. This is a three-step argument. First, I am going to go over the weakness of US civil service and its consequences. Second, I am going to step back and describe the political mentality that leads to weak civil service, which centers the local community at the expense of the state. And third, I am going to relate this and similar examples of excessive localism in the US to the country’s unique history of racism. In effect, I am going to go backward, describing the effect and then looking at its causes. The argument is as follows: the US has a weak civil service. There’s relatively little in-house expertise, and weak planning departments. The rapid transit extensions of London and Paris are driven mostly by professional planning departments (Transport for London is especially powerful), with the budgets debated within their respective national parliaments. In contrast, in New York, while Second Avenue Subway was similarly driven by an internal process, other rail extensions were not: the 7 extension is Bloomberg’s project, the ongoing plans for BQX and the LaGuardia AirTrain are de Blasio and Cuomo’s projects respectively, and Gateway in its various incarnations is political football among several agencies and governments. Similarly, while the TGV was developed internally at SNCF with political approval of the overall budget, American plans for high-speed rail involve a melange of players, including consultants. The more obvious effect of the weakness of the American civil service is that, with political control of planning and not just of the budget, it’s easy to build low-performance infrastructure such as the 7 extension. However, there are three ways in which this problem can increase costs, rather than just lead to poor priorities. First, it is easier to have agency turf battles. The US has no transport association coordinating planning like STIF in Ile-de-France or any number of German-speaking Verkehrsverbünde (Berlin’s VBB, Zurich’s ZVV, etc.). Even when one agency controls all transit in an area, like SEPTA in Philadelphia or the MBTA in Boston, powerful internal cultures inhibit reforms aiming at treating mainline rail like regular public transit. An instructive example of better civil service is Canada: while Canadian civil service is also weak by Continental European or Japanese standards, it is strong enough that Metrolinx plans to raise off-peak frequency and at least in theory aims at fare integration, over the objections of the traditional railroaders who, like their American counterparts, like the situation as it is today. Without any structure that gets different agencies to coordinate plans, overbuilding is routine. I blogged about it a few months ago, giving the examples of Gateway and East Side Access in New York and San Jose Diridon Station. A second Bay Area example, not mentioned in the post, concerns Millbrae, where BART holds on to turf it does not need, leading California High-Speed Rail to propose a gratuitous $1.9 billion tunnel: see posts on Caltrain-HSR Compatibility here and here. Second, there is less in-house supervision of contracting. Brian Rosenthal’s article about Second Avenue Subway’s construction costs talks, among other things, about the lack of internal expertise at the MTA about running large projects. This is consistent with Manuel Melis Maynar’s admonition that project management should be done in-house rather than by consultants; Melis managed to build subways in Madrid for around $60 million per km. It’s also consistent with what I’ve heard from MBTA insiders as an explanation for the cost blowout for Boston’s Green Line Extension, an open-cut light rail so expensive it was misclassified as a subway in a Spanish comparison; as I mention in CityLab, once the MBTA found a good project manager it managed to substantially reduce costs. Weaker in-house supervision has knock-on effects on procurement practices. An agency that can’t easily oversee the work it pays for has difficulty weeding out dishonest or incompetent contractors. One way around it is strict lowest-bid rules, but these offer dishonest contractors an opportunity to lowball costs; California has a particular problem with change orders. In New York, I’ve heard from several second-hand sources that to prevent contractors from doing shoddy work, the specs micromanage the contractors, leading to more expensive work and discouraging good builders, who can get private-sector work, from bidding. If fewer contractors bid, then there is less competition, increasing cost further. In contrast, Melis Maynar’s prescription is to offer contracts based primarily on the technical score and only secondarily on cost, to ensure quality work. But this requires objective judgment of technical merit, which American bureaucrats are not good at. And third, the US’s weaker state capacity leads to problems with NIMBY opposition to infrastructure. This does not means the US can’t engage in eminent domain (on the contrary, its eminent domain laws favor the state). But it means that agencies feel like they’re politically at the mercy of powerful local interests, and can’t propose projects with high community impact that they can negotiate with local landowners. The impetus for the SECoast’s hiring me to analyze high-speed rail in Fairfield County is that the NEC Future plan was vague about that area; an insider at one of the NEC Future consultants told me that this was specifically because the consultant was worried about NIMBYism in that part of the state, so an “unspoken assumption” was that the area should not be disturbed. This kind of preemptive surrender to NIMBYism leads to inferior projects, like agency turf battles: cost-effective solutions are not pursued if consultants are worried about political pushback. But, like agency turf battles, it also leads to higher costs, if the reports propose expensive remediation such as tunnels. Any attempt to build a strong bureaucracy in the United States runs into entrenched interests, most of which are local. These interests are empowered politically rather than legally. The NIMBYism example is the cleanest case study. The United States does not have a legal regime that empowers NIMBY opposition in eminent domain cases. On the contrary, the state can condemn property with relative ease, and the arguments are over price. Under Kelo, the state can even expropriate land and to give to a private developer. In contrast, in Japan the process is more difficult: in a 1994 Transportation Research Board paper, Walter Hook says that urban landowners in Japan enjoy strong legal protections, which requires the state to pay a high price for property takings. About 75-80% of the cost of urban highway construction in Japan is land acquisition, versus only 25% in the US (both figures are lower for rail, which is more space-efficient; the paper argues that Japan’s difficult land acquisition led it to favor the more space-efficient mode for its urban transportation network). Moreover, in Japan as well as in France, property owners have extralegal means of fighting infrastructure: they can take to the streets. The construction of Narita Airport faced riots by landowners, encouraged by leftists who opposed the airport’s use by the US military; and in France, blocking roads is a standard way of protesting, and there is little the state can do against it. SNCF resolves this issue in building high-speed lines for TGVs by spending years negotiating with landowners and coming up with win-wins in which it pays extra to make the owners go away quietly. With a legally stronger state, the US needs to come up with different ways to protect powerful property owners from arbitrary expropriation. The mechanism the country settled on is political empowerment of local interests. If rich individuals in Fairfield County or on the San Francisco Peninsula can interfere with the construction process, then they can rest assured the state will not be able to build a rail alignment that wrecks their real or imagined quality of life. The point I made repeatedly in my writeup about high-speed rail in Fairfield County (funded by those rich individuals) is that there is some real visual and noise impact, but it’s possible to mitigate it in most cities using noise barriers and trees, and as compensation use the faster tracks to offer faster commuter rail service; only Darien has unmitigable impact. The same localism encourages agency turf battles. The LIRR, Metro-North, and New Jersey Transit could provide much better rail service in their respective service areas by integrating planning, but this would compel local interests to give up control. Long Islanders would have to interact directly with the Tri-State Area’s transport association, in which they’d be only 12% of the population and 5% of transit ridership; today they interact with planning via their powerful elected representatives, who can block any change that is unfavorable to incumbent riders. The main losers here are potential riders. It is possible to come up with a win-win (there’s so much schedule padding a local train could be as fast as today’s super-express trains), but it is not possible for any coordinated planning department to credibly promise that the suburbs would retain the priority they have today. For the same reason, even vertically integrated SEPTA and the MBTA find it difficult to engage in integration – the suburbs would lose their special status. In contrast, planning in France and Britain is more centralized, and the local communities were never so empowered. The two main players in STIF are RATP and SNCF. RATP serves Paris, and SNCF is the national railroad and does not view itself as catering to the suburbs even if those suburbs are the overwhelming majority of SNCF’s ridership. The rich can exercise direct political influence: thus, the state just committed to building the entire Grand Paris Express, despite cost overruns, without pruning the unnecessary airport connector that is Line 17 or the low-ridership favored-quarter suburban circumferential that is Line 18. But they can’t block projects as easily as in the US. The US achieves democratic checks and balances by having many veto points on every law. In Congress, a law needs majorities in both houses and a presidential signature, or supermajorities in both houses. Moreover, achieving a majority in each house requires not only the support of the majority of legislators, but also the support of the majority of legislators in the majority party (the Hastert Rule). In each state legislature, the process is largely similar. In nonpartisan or effectively single-party legislatures, such as the New York City Council, votes on such local issues as rezoning informally require the approval of the legislator representing the district in question; David Schleicher, who has elsewhere investigated high US subway construction costs, has a paper on this local representative privilege explaining why upzoning is difficult in large cities. This localism is absent from other democracies. Westminster systems just don’t have checks and balances, only traditions, occasionally supplemented by narrow civil liberties-oriented constitutions like the Canadian Charter of Rights and Freedoms. As a result, Ontario could pass a rent control law overnight; with this regulatory uncertainty, it’s no wonder that for years, even before the law, fearful developers built mostly condos rather than rental units. In most other democracies, checks and balances instead rely on proportional representation and a multiparty system: laws in Germany or Scandinavia require a parliamentary majority, and restrictions on the government’s ability to pass big changes overnight with no debate come from the ability of class-based and ideological interests to activate entire political parties. Coalition agreements still specify the agenda, roughly equivalent to the Hastert Rule, but parties can freely campaign for changes in elections, reducing the ability of a minority to block change. In some systems, most notably Switzerland, it’s also possible to use referendums to direct spending. This way, local magnates opposed to the expansion of civil service are disempowered, while at the same time the civil service cannot easily use its powers to create internal slush funds, because it is still overseen by a political majority that cares little for corruption. The superficial reason why the US prefers localism to civil service is that it is historically localist. New England had powerful town halls from early white settlement, and Americans like to tell themselves that they have a lively tradition of self-government and individualism. But this is incorrect. Israelis in the United States often comment that far from individualist or self-governing, Americans are unusually rule-bound and obedient, compared with not just Israelis but also Europeans. More to the point, traditions of localism exist in much of Europe. Switzerland is famous for this, and yet it’s managed to develop civil service planning transportation; referendums exert a powerful check on the ability of the state to spend money, but do not micromanage planning, and as a result the state makes cost-effective plans rather than retreating and letting local suburbs decide what to build. Moreover, most European countries have undergone rounds of municipal consolidation, converting formerly independent suburbs or villages into parts of larger cities or townships. France has uniquely not done so, and is therefore extremely fractionalized, with 30,000 communes, about the same as the number of municipalities in five times more populous America; but in France the communes are for the most part weak, and most subnational government is done by departments and regions. The US, in contrast, maintained its suburbs’ autonomy. The answer to the question of why the US has done so is simple: racism. Suburban consolidation came to a hard stop once the cities became more diverse than the suburbs. Relying on prior town lines could offer suburban whites something they craved: protection from integration, especially school integration. It would be difficult to consolidate education policy, even at the state level, and maintain the white middle and working classes’ desired segregation levels. Thus, the US prefers the second-best policy of maintaining localism. The same principle also underlies much election disenfranchisement (giving white poll workers authority to reject black voters’ credentials), today and even more so before the Voting Rights Act. Transit faces the same issue. The traditional American transit cities’ suburbs have fast expensive trains for middle-class, mostly white suburban commuters to city center, and slow, cheap suburban buses for poor minorities working service jobs in the suburbs. Stephen Smith, who spent some time on the NICE buses on Long Island and compared their demographics with those of the LIRR, calls this “separate and unequal.” This segregation would not survive any coordinated planning; even ignoring racial equality, it’s inefficient. I frequently reference the story of George Wallace’s evolution. Wallace was once a sensible politician who generally was seen as fair-minded by black leaders in Alabama. But he lost the gubernatorial election after being tarred by John Patterson as too friendly to black people. Wallace subsequently vowed to never be “out-niggered” again and thus began his long dark march into history. You know, I tried to talk about good roads and good schools and all these things that have been part of my career, and nobody listened. And then I began talking about niggers, and they stomped the floor. The only way to maintain racism is to weaken institutions. It’s hard to have a clean system of apartheid justice, because then the oppressed minority can simply demand the state treat it the way it treats the herrenvolk. A state that attempted to impose apartheid with clean government would not be able to credibly promise to the racists that the system would stay as is. Instead, it would need to engage in arbitrary justice, giving individual cops, judges, and juries broad latitude to make decisions, which could survive the end of formal apartheid to some extent. The US built roads in the 1950s and 60s by running them through low-income black urban neighborhoods. The book The Big Roads says that road planners figured that those areas were already declining and had low property values, so it was cheap to build there; in one tone-deaf example, planners in Washington tried surveying roads after a race riot, figuring that it was the best time to demolish buildings, until outraged civil rights groups put a stop to the process. The problem is that black neighborhoods were cheap because of redlining. The federal government spent 30 years wrecking the property values of black neighborhoods and then acquired property for cheap to build infrastructure for then-white suburban drivers. For the same reason, there is much less tolerance toward protest in the US than in other democracies. If Americans tried reacting to adverse changes the way the French react, the police would shoot them. If the US engaged in a process to reduce its police brutality rates to levels that Europeans tolerate, black people would be able to free to roam the streets and make racist whites uncomfortable. Thus, the US refrains from giving property owners any formal legal or extralegal protections from expropriation. Instead, it promises security of property to the middle class by underinvesting in institutions that could come up with bureaucratic rules for expropriation. Legally excluding minorities is difficult; politically excluding them is easy. The natural end of this system is to ensure the locus of protection from expropriation is political rather than legal. When the US protects individuals from the predations of the state, it does so by letting people sue the government; this contrasts with regulatory protections, such as the Nordic ombudsman system. While suing the government is in theory a legal protection, in practice it depends on familiarity with the court system, which privileges people with connections and legal knowledge. When the state does spend political capital on getting what it wants, some rich individuals can sue indefinitely to delay projects; the poor have no such recourse. While this is partly a legacy of the common law system, indefinite delay by lawsuit is rare in the rest of the common law world, leading to British stereotypes that Americans are overly litigious. The US is not uniquely racist. Its levels of economic discrimination against minorities seem fairly average to me by developed-country standards. Moreover, the extent of political exclusion of black Americans is arguably the smallest among all large groups of nonwhite minorities in white-majority countries. Barack Obama faced considerably racism as president, but he did win by a fair margin, and for years beforehand the media normalized the idea of a black president (as in the TV show 24 or the film Deep Impact). In contrast, a Muslim French president would be unthinkable. Even the Trump cabinet is more diverse than the Macron cabinet, which has one black member (the minister of sport) and one part-Algerian member (the minister of public accounts); the Clinton, Bush, and Obama cabinets all had minorities in far more senior positions. However, the US is unique in that it was racially diverse early, requiring its political system to adapt to a state of slavery and subsequently apartheid. Europe, in contrast, formally applies the rules of liberal democratic participation, developed when there were few minorities, to an increasingly diverse electorate. To the extent that European racists are dissatisfied with this arrangement, they try to push for localism as well: British xenophobia borrows rhetoric from American local racism, substituting neo-Confederate dislike for the US federal government for anti-EU sentiments. Similarly, Swiss racists push for rules putting every naturalization to a referendum, ensuring that long-settled white Germans and Italians could naturalize while nonwhites could not. With the need to maintain apartheid embedded into the American legal and political systems, it had to underinvest in state capacity. A uniform civil service with clear rules would have to treat everyone equally, and if it didn’t, it would be so obvious that civil rights advocates would be able to easily push for change. For the same reason, the US didn’t design rules that would guarantee security of property to all citizens while allowing the government to function in those cases where expropriation was required. Such rules would equally protect whites and blacks, and allow the black middle class to build wealth on the same terms as whites. Instead, its legal system empowers the state in eminent domain cases and requires individuals to either use their political pull to protect themselves or to attempt to sue the government for just compensation, neither of which option protects unorganized or disempowered communities. With planning done by ad hoc arrangements and excessive empowerment of local interests, it is difficult to engage in any regional coordination. Even when none of the actors is a racist, or when all relevant communities are white, parochial local interests are stronger than the civil service and have many levers with which they can block change. With a change-averse political system, planning is run by autopilot, keeping traditional arrangements as they are. Aversion to change, poor coordination, and ad hoc planning all lead to bad government, but are especially deleterious for public transit. Two road agencies that work independently in neighboring jurisdiction could build a single continuous road. Two public transit agencies in the same situation could build a railroad but not operate it. Moreover, with the bulk of spending on roads coming from individual consumers buying cars and fuel, a car-based transportation system is more resilient to bad government than a transit-based one, in which all spending is directed by a transit agency. It’s hard to have an organization-before-electronics-before-concrete mentality when organization is stymied by the overarching need to maintain white middle-class local autocephaly. The end result is that transit planning departments are too weak to prioritize projects the right way and even to control costs of spending that benefits the white middle class. None of this was intentional. Racism was of course intentional, but the political compromises between racist and nonracist whites that created American governance as it is today were not intended to wreck American state capacity. They just did so as a side product of guaranteeing the desired levels of political and economic exclusion. The importance of intent is that reducing the extent of racism in the US in the future, while obviously desirable, is independent of fixing public transit. Some individual bad decisions today, such as Larry Hogan’s cancellation of the Red Line in Baltimore, are directly racist, but a lot of agency turf (such as between different commuter rail agencies) is not, and neither are high construction costs. Fixing the problems of US transit planning requires improving the relevant planning departments, but this is so narrowly-focused as to neither require nor be a natural consequence of fighting racism. However, there is an entire world out there beyond public transit. When the US built its current racist system, during the midcentury transition period from apartheid to more-or-less equal democracy, probably the most obvious racially charged issue was school integration; the effect on transportation policy was a byproduct. Likewise, if the US makes a concerted effort to move toward racial equality, or if any European country with high immigration rates makes a concerted effort to avoid falling into an American racist trap, the improvements in governance will have far-reaching unforeseen benefits in the future. It is relatively easy to come up with a database of urban rail lines and their construction costs per kilometer. Construction costs are public numbers, reported in the mass media to inform citizens and taxpayers of the costs of public projects. However, the next step in understanding what makes American construction costs (and to a lesser extent common law construction costs) so high is breaking down the numbers. The New York Times published an excellent investigative piece by Brian Rosenthal looking at why Second Avenue Subway specifically is so expensive, looking at redundant labor and difficulties with contractors. But the labor examples given, while suggestive, concern several hundred workers, not enough for a multibillion dollar cost difference. More granularity is needed. After giving examples of high US construction costs outside New York, I was asked on social media whether I have a breakdown of costs by item. This motivated me to look at station construction costs. I have long suspected that Second Avenue Subway splurged on stations, in two ways: first, the stations have full-length mezzanines, increasing the required amount of excavation; and second, the stations were mostly excavated from inside the tunnel, with only a narrow vertical access shaft, whereas most subway lines not crossing under older lines have cut-and-cover stations. The data I’m going to present seems to bear this out. However, it is critical to note that this data is much sparser than even my original post about construction costs. I only have data for three cities: New York, London, and Paris. In New York, Second Avenue Subway consisted of three new stations: 96th Street, 86th Street, and 72nd Street. Their costs, per MTA newsletters: 72nd Street cost $740 million, 86th Street cost $531 million, 96th Street cost $347 million for the finishes alone (which were 40% of the costs of 72nd and 86th). MTA Capital Construction also provides final numbers, all somewhat higher: 72nd Street cost $793 million, 86th Street cost $644 million, 96th Street cost $812 million. The 96th Street cost includes the launch box for the tunnel-boring machine, but the other stations are just station construction. The actual tunneling from 96th to 63rd Street, a little less than 3 km, cost $415 million, and systems cost another $332 million. Not counting design, engineering, and management costs, stations were about 75% of the cost of this project. In Paris, Metro stations are almost a full order of magnitude cheaper. PDF-p. 10 of a report about Grand Paris Express gives three examples, all from the Metro rather than GPX or the RER, and says that costs range from €80 million to €120 million per station. Moreover, the total amount of excavation, 120,000 m^3, is comparable to that involved in the construction of 72nd Street, around 130,000 m^3, and not much less than that of 86th Street, around 160,000 m^3 (both New York figures are from an article published in the Gothamist). Rosenthal’s article documents immense featherbedding in staffing the TBMs in New York, explaining much more than a factor of 1.7 cost difference. This is not by itself surprising: Parisian construction costs are far from Europe’s lowest, and there is considerable featherbedding in operations (for example, train driver productivity is even lower than in New York). It suggests that Paris, too, could reduce headcounts to make tunnel construction cheaper, to counteract the rising construction costs of Grand Paris Express. But the situation with the stations is not just featherbedding: the construction technique New York chose is more expensive. The intent was to reduce street disruption by avoiding surface construction. Having lived on East 72nd Street for a year during construction, I can give an eyewitness account of what reducing disruption meant: there was a giant shaft covering about half the width of Second Avenue, reducing sidewalk width to 7 feet, between 72nd and 73rd Streets. This lasted for years after I’d moved away, since this method is so expensive and time-consuming. Under cut-and-cover, this disruption would cover several blocks, over the entire length of the station, but it would be finished quickly: the extension of Line 12 is currently in the station digging phase, estimated to take 18 months. London provides a useful sanity check. Crossrail stations are not cut-and-cover, since the line goes underneath the entirety of the Underground network in Central London. Canary Wharf is built underwater, with 200,000 m^3 of excavation and 100,000 m^3 of water pumped; it’s technically cut from the top, but is nothing like terrestrial cut-and-cover techniques. The cost is £500 million. It’s a more complex project than the comparably expensive stations of Second Avenue Subway, but helps showcase what it takes to build stations in areas where cut-and-cover is not possible. Another useful sanity check comes from comparing subway lines that could use cut-and-cover stations and subway lines that could not. Crossrail is one example of the latter. The RER A’s central segment, from Nation to Auber, is another: Gare de Lyon and Chatelet-Les Halles were built cut-and-cover, but in the case of Les Halles this meant demolishing the old Les Halles food market, excavating a massive station, and moving the Metro Line 4 tunnel to be closer to the newly-built station. The total excavated volume for Les Halles was about 560,000 m^3, and photos show the massive disruption, contributing to the line’s cost of about $750 million per km in today’s money, three times what Paris spends on Metro extensions. In London, all costs are higher than in Paris, but without such difficult construction, the extension of the Underground to Battersea is much cheaper than Crossrail, around $550 million per km after cost overruns and mid-project redesigns. The good news is that future subway extensions in the United States can be built for maybe $500-600 million per km rather than $1.5-2 billion if stations are dug cut-and-cover. This is especially useful for Second Avenue Subway’s phase 2, where the segments between the station boxes already exist thanks to the aborted attempt to build the line in the 1970s, and thus cut-and-cover stations could simply connect to already-dug tunnels. It could also work for phases 3 and 4, which cross over rather than under the east-west lines connecting Manhattan with Queens and Brooklyn. The same technique could be used to build outer extensions under Utica and Nostrand in Brooklyn. Among the top priorities for New York, only a crosstown subway under 125th Street, crossing under the north-south line, would need the more expensive station construction technique; for this line, a large-diameter TBM would be ideal, since there would be plenty of space for vertical circulation away from the crossing subway lines. There would still be a large construction cost premium. Changing the construction method is not enough to give New York what most non-English-speaking first-world cities have: getting down to $200 million per kilometer would require changes to procurement and labor arrangements, to encourage competition between the contractors and more efficient use of workers. Evidently, overheads are a larger share of Second Avenue Subway cost than of Parisian costs. But saving money on stations could easily halve construction costs, and aspirationally reduce them by a factor of three or four. c) is unaware that the cost reduction he promises, relative to American construction costs, has already been achieved in a number of countries. Go electric. Current tunnel operations often include diesel locomotives. These can be replaced by electric vehicles. This is not the first time that Musk thinks he can save a lot of money by reducing tunnel diameter; he said the same thing in the Hyperloop paper. Unfortunately for him, there is literature on the subject, which directly contradicts what he says. In my Urbanize piece, I mention a study done for the Very Large Hadron Collider, which compares different tunnel diameters across various soil types, on PDF-p. 5. Two tunnel diameters are compared, 4.9 m (16′) and 3.9 (12′). Depending on soil type and tunnel boring machine (TBM) drive, the larger tunnel, with 1/3 larger diameter, costs 15-32% more. Subsequent pages in the study break down the costs per item. The TBM itself has a cost that scales with cross-sectional area, but is only a small minority of the overall cost. The study assumes five drives per TBM, with the first drive accounting for 75% of the TBM’s capital cost; in the first drive the larger-diameter tunnel is 32% more expensive, since the TBM accounts for 25-40% of total cost depending on diameter and rock, but in subsequent drives the TBM accounts for about 5% of total cost. Another 6% is muck cars (item 2.05, PDF-pp. 7 and 46), whose cost rises less than linearly in tunnel diameter. The rest is dominated by labor and materials that are insensitive to tunnel width, such as interior lighting and cables. But the actual cost is even less sensitive to tunnel width. The VLHC study only looks at the cost of tunneling itself. In addition, there must be substantial engineering. This is especially true in the places where transportation tunnels are most likely to arise: mountain crossings (for intercity rail), and urban areas (for urban rail and road tunnels). This is why there’s a trend toward bigger tunnels, as a cost saving mechanism: BART’s San Jose extension is studying different tunnel approaches, one with a large-diameter tunnel and one with twin small-diameter tunnels, and the cost turns out to be similar. In Barcelona, the large-diameter TBM actually saved money and reduced disruption in construction. The Boring Company’s various bullet points after its point about tunnel diameter are irrelevant, too. For example, labor is a substantial portion of TBM costs, but in the VLHC study it’s about one third of the cost in easier rock and 15% in harder rock. There appears to be a lot of union featherbedding in some American cities, but this is a political rather than technological problem; without such featherbedding, labor costs are not onerous. At $10 billion for just 2.2 km of new tunnel, East Side Access is the most expensive urban rail tunnel I am aware of. The second most expensive, Second Avenue Subway’s first phase, costs $1.7 billion per km, not much more than a third as much. Is New York really spending $10 billion on just boring 2.2 km of tunnel? Of course not. The 2 km in Manhattan cost a little more than $400 million, per an MTA status report from 2012 (PDF-p. 7). The few hundred meters in Queens actually cost more, in an unnecessary tunnel under a railyard. The cavern under Grand Central cost much more, as do ancillary structures such as ventilation. The TBM is probably the most technologically advanced portion of urban tunneling today. Even in New York, in the most expensive project ever built, the TBM itself is only responsible for about $200 million per km; more typical costs, cited in a consultant’s report for Rocky Mountain tunneling, are somewhat less than $100 million per km. This is why large-diameter TBMs are so appealing: they increase the cost of the tunneling itself, but save money everywhere else by allowing stations to be constructed within the bore. Of course, The Boring Company is not building conventional subways. Subways already exist, and Musk likes reinventing everything from the wheel onward. Instead, the plan is to build tunnels carrying cars. This means several things. First, the capacity would be very low, especially at the proposed speed (Musk wants the cars to travel at 200 km/h – excessive speed is another of his hallmarks). Second and more importantly, instead of having to deal with expensive subway stations, the infrastructure would have to deal with expensive ramps. Musk wants cars to be lowered into the tunnels with elevators. Underground elevators are cheap (vertical TBMs are easy), but in the proposed application they just move the problem of ramps deeper underground: the elevator (“skate” in Musk’s terminology) would carry the cars down, but then they’d need to accelerate from a standstill to line speed, in new tunnels, separate from the mainline tunnels so as to avoid slowing down through-traffic. Trains solve this problem by making the entire train stop in the tunnel and taking the hit to capacity, and compensating by running a long train with many more people than cars could possibly hold. But roads would need the same infrastructure of urban freeways, underground. Switching between tunnel trunks poses the same problem. Flying junctions are expensive, especially underground. In New York, they were common on the IND subway, built in the late 1920s and 1930s; the IND was expensive for its time, around $150 million per route-km in today’s money, whereas the Dual Contracts from the 1910s and early 20s (with fewer junctions) were about $80 million per underground route-km. Most subway systems don’t do what the IND did, and instead of complex junctions they build independent lines, switching between them using transfer stations. With cars, this solution is impossible, forcing underground four-level interchanges; even above ground, those interchanges cost well into the 9 figures, each. The starting point of The Boring Company is that Los Angeles’s tunnel construction costs, which the company pegs at a billion dollars per mile, need to be reduced by a factor of ten. This means cutting them from about $600 million per km to $60 million. While there is nothing that Musk or his company has said in public that suggests he is capable of reducing construction costs, other parts of the world have substantially done so already. In my construction costs posts, there are a few projects in the $60 million/km area. Manuel Melis Maynar, the former CEO of Madrid Metro, wrote a brief report on how he built subways cheaply; in today’s money, the underground parts of Madrid’s 1999-2003 subway expansion cost around $70 million per km, but this includes rolling stock, and without it, actual cost is likely to be where Musk wants it to be. Recent subway lines in Seoul have also been in that area, including Metro Line 9 and the Sin-Bundang Line. Going up to $100 million per km, there are more lines in Stockholm. Melis Maynar’s writeup ignores any of the technological pizzazz Musk thinks of. Instead of trying to squeeze more power out of TBM, he emphasizes good contracting practices, and separation of design and construction. Like Musk, he believes that faster construction is cheaper, but he is aware that the limiting factor is not boring speed: even at a conservative rate of 15 meters per day, a TBM could excavate several kilometers a year, so it’s better instead to begin construction at several points along the line and work in parallel rather than in sequence. Adding TBMs does not make projects substantially more expensive: one TBM used for East Side Access cost $6-8 million, and other estimates I’ve seen only reach into the 8 figures, for multibillion dollar projects. Nor does adding staging areas raise cost underground, where there are many potential sites; underwater it’s a bigger problem, and there costs are indeed much higher, but nothing that Musk does seems designed around underwater tunnels, and his proposed map for LA road tunnels is underground. Americans hate being behind. The form of right-wing populism that succeeded in the United States made that explicit: Make America Great Again. Culturally, this exists outside populism as well, for example in Gordon Gekko’s greed is good speech, which begins, “America has become a second-rate power.” In the late 2000s, Americans interested in transportation had to embarrassingly admit that public transit was better in Europe and East Asia, especially in its sexiest form, the high-speed trains. Musk came in and offered something Americans craved: an American way to do better, without having to learn anything about what the Europeans and Asians do. Musk himself is from South Africa, but Americans have always been more tolerant of long-settled immigrants than of foreigners. In the era of Trump, this kind of nationalism is often characterized as the domain of the uneducated: Trump did the best among non-college-educated whites, and cut into Democratic margins with low-income whites (regardless of education). But software engineers making $120,000 a year in San Francisco or Boston are no less nationalistic – their nationalism just takes a less vulgar form. Among the tech workers themselves, technical discussions are possible; some close-mindedly respond to every criticism with “they also laughed at SpaceX,” others try to engage (e.g. Hyperloop One). But in the tech press, the response is uniformly sycophantic: Musk is a genius, offering salvation to the monolingual American, steeped in the cultural idea of the outside inventor who doesn’t need to know anything about existing technology and can substitute personal intelligence and bravery. In reality, The Boring Company offers nothing of this sort. It is in the awkward position of being both wrong and unoriginal: unoriginal because its mission of reducing construction costs from American levels has already been achieved, and wrong because its own ideas of how to do so range from trivial to counterproductive. It has good marketing, buoyed by the tech world’s desire to believe that its internal methods and culture can solve every problem, but it has no product to speak of. What it’s selling is not just wrong, but boringly so, without any potential for salvaging its ideas for something more useful. The most annoying person I regularly deal with on social media is Walkable Princeton/YIMBY Princeton, a biology professor at Rutgers who constantly criticizes my writings on comparative construction costs, and usually raises good points. Dealing with zombie arguments (China, anything Elon Musk says, etc.) is so much easier. A few days ago, he put up a post summarizing 20 potential reasons why subway construction costs in New York (and in the US in general) are high. He’s also repeatedly made a separate argument on social media, not mentioned in the post, expressing skepticism that the construction cost differences are real, rather than just statistical artifacts. In this post, I am going to purposely not talk about the two biggest criticisms – the claim about the statistical differences, and the argument from local expertise (points #7 and #8 in his post). Those require dedicated posts, and the argument from local expertise should really be tackled in two separate posts, one about project size (comparing cities that build long subway lines with ones that build many short subway extensions) and one about the undisputed negative correlation between construction costs and the extent of construction across cities. I will deal with this in the next few weeks or months, depending on publishing schedules elsewhere. In this post I’m instead going to deal with the weaker criticisms. The first five points made in the post come from arguments I discussed here, saying that they are not real reasons why US construction costs are high. The sixth point concerns project size. Since the seventh and eighth point will be a dedicated post, I will start with the ninth point. Of note, many of the explanations offered are serious and relevant, just not to the specific problem of high construction costs of urban rail. They are relevant to some construction costs problems for high-speed rail, and operating costs, and rolling stock procurement costs. But the explanation for expensive urban tunneling is most likely elsewhere. Only one point below, #13, begins to address that specific issue, and even it seems to me to be at most a partial explanation. 9. ‘Buy America’ provisions – Regulations requiring transit agencies to purchase equipment built in the US may drive up costs, as overseas manufacturers have to build a factory in the US to produce the needed kit. Other nations buy transit equipment more regularly, so have ready access to an efficient supply chain. Buy America provisions indeed raise American costs for small orders – but only for rolling stock. Dedicated factories, often built in-state for added protectionism, make trains for $3-5 million per car (for example, compare Muni Metro’s $4 million/car order for 23-meter cars with Strasbourg’s $4 million/car order for 45-meter cars). Only the biggest orders, such as those for the New York City Subway, the LIRR, and Metro-North, have enough scale to control costs. However, this is not an issue for infrastructure construction. The bulk of the cost of civil infrastructure is not specialized machinery, which American cities import anyway (the tunnel-boring machine for the 7 extension was made in Germany). It’s local labor and materials, and less specialized machinery for digging earthworks for stations. 10. Bad attitude – Call it a ‘New York state of mind’ – MTA old dogs may prefer to see a project fail than to be proven wrong or see praise go to an agency rival. Not clear that New Yorkers have a worse attitude than people from other big cities, but certainly worth considering. 11. Chaotic political environment – Transit projects must be agreed by too many agencies and personalities, some of whom may have conflicting priorities. For example, NY Governor Andrew Cuomo doesn’t seem to get on with Mayor Bill DiBlasio, and the less said about Governor Christie the better. Personality clashes and inter-state squabbling at the Port Authority board have frustrated long-term planning. Donald Trump controls federal funds that may be needed to fund new transit projects. These are really the same criticism: agency turf battles. Those can make cities build the wrong project, or overbuild a tunnel in order to avoid sharing facilities with another agency. The bulk of the construction costs of high-speed rail on the Northeast Corridor, and a large fraction of those of California HSR, come from this. Readers who are familiar with debates about California HSR will know about the Altamont vs. Pacheco Pass controversy and about avoidable tunnels like Millbrae. However, this isn’t really what’s happening in urban subways. The Gateway project has unnecessary scope like Penn Station South, but even the bare tunnel is estimated at $11 billion. 12. Lack of stable long-term funding – Long-term funding for transit projects is uncertain, and even part-built projects can be canceled at any moment (see Governor Christie, ARC tunnels). New York has a long track record of abandoning transit projects, and the Second Avenue Subway project took nearly 100 years to do. Midway cancellations are really a symptom of high costs rather than a cause. At cancellation, ARC was projected to cost $10-13 billion, up from $3 billion in the major investment study from 2003. This is not unique to the United States: high costs and construction impact for Stuttgart 21 led to widespread opposition to the project from within Stuttgart, leading to the election of Germany’s first Green-led state government; the Green Party opposed Stuttgart 21 and proposed a cheaper, lower-impact project without tunneling. It did not cancel the project, but put it up to referendum, which failed – the majority of state voters, and even of Stuttgart voters, wanted the project to keep going. Going to a second referendum on canceling a project, rather than canceling it by executive fiat as in New Jersey, is not unique to Germany: in Florida, Governor Jeb Bush put a second referendum on the ballot in 2004, successfully killing high-speed rail. 13. Project bloat – Planners may over-do transit infrastructure, for example by hiring a superstar architect like Santiago Calatrava to design the Port Authority PATH station instead of ‘Joe Goodenough’. Cavernous two-level stations in the new Second Avenue Subway stations may not contribute substantially to function, and drive costs up a lot. This is indeed a serious problem! New York has been overbuilding stations since the 1930s, when the IND subways had full-length mezzanines. I encourage the New York-based readers to compare the size of the stations on the IND, such as West 4th Street or 145th Street on the A/B/C/D, and that of the stations on the IRT and BMT, such as Union Square. The Calatrava-designed PATH terminal was massively expensive more recently, and Second Avenue Subway is expensive in part because of the large stations. And yet. Even relatively utilitarian American projects aren’t always cheap – again, the bare Gateway tunnel. Moreover, some of the project bloat is not really about overdesign, but about wrong political choices. Second Avenue Subway had no cut-and-cover construction except at 96th Street to stage the tunnel boring. Second Avenue is wide and the entire line could be built cut-and-cover. Cut-and-cover is highly disruptive to street merchants, but a hybrid solution, with cut-and-cover stations and bored tunnels between them, is possible and widespread in several low- and medium-cost cities, such as Madrid and Copenhagen. But even the stations were bored, which limited surface disruption at each station to a few cross streets, but made construction take much longer; the corner of 72nd and 2nd was unpleasant to walk around for most of the duration of the ten-year project. 14. Fire safety regulations – Modern standards for smoke clearance and emergency evacuation may require larger two-level stations that appear bloated. 15. Environmental regulations – Disruption to fragile ecosystems may not be as tolerated in the New York area as in some other countries, driving up costs. 16. ADA standards – Transit stations in New York must comply with federal accessibility requirements, meaning many elevators that drive up costs. These issues exist throughout the developed world. New subways are step-free even in cities that make no effort to retrofit the rest of the system for wheelchair accessibility, such as Paris. We also know how much it costs to add elevators to stations, and it is a rounding error: during construction, making five more Crossrail stations accessible costs £19 million. Even retrofitting an old subway station for accessibility after construction is $25-40 million in the US (source: article about New York, interview with an accessibility planner in Boston). And as for environmental regulations, I doubt there are endangered species on the Upper East Side under Second Avenue. 17. Americans don’t care about transit – Other nations may take pride in their fancy rail systems, but we’ve got aircraft carriers and don’t care if the subway looks pretty worn. 18. High levels of sprawl – Whereas NYC is dense at the core, the surrounding metro area is not very dense. The Los Angeles metro area is in fact denser than the New York metro area. Low housing density, especially in the areas where rich folks live, makes transit less efficient and undermines public support for expensive transit investments. Suburban drivers may not want to spend money on subways, but that should not make subways more expensive to build. It should reduce cost per rider, in the sense of lowering the maximum cost per rider that the political system is willing to build; but the effect on cost per km should be neutral. 19. Corruption – Is the Mob siphoning off loads of the money that is supposed to go to build transit?? It probably is. And yet, corruption levels in Italy are far higher than in the United States, and yet costs are pretty low. Corruption levels in Spain and South Korea aren’t especially low. And Singapore, renowned for its clean government (below the level of the prime minister, at least, but he doesn’t decide on subway alignments), is a serious contender for most expensive subway outside the United States. 20. Terrible leadership – Ronnie Hakim, the current MTA Director, is supposedly seen as incompetent by many of her staff. Joe Lhota, the MTA Chair, doesn’t even work full-time at the job. The Port Authority Board is stuffed with Chris Christie stooges, some of whom may know nothing about transit. Hakim is incompetent and I have sources within the MTA who are exasperated with her indifference to one of the most fundamental goals of rapid transit (namely, being rapid). Much like explanation #9, there is a serious problem here, but it doesn’t affect tunneling costs. It affects operating costs, which appear to be higher in New York than in any other city participating in CoMET (see PDF-p. 7 here: the highest-cost system on the right is in fact New York). But it is not about tunneling. Unlike Hakim, long-time MTA Capital Construction chief Michael Horodinceanu is not hated by the junior and mid-level planners who leak to the press, and unlike Lhota, he works the job full-time worked the job full-time until retiring earlier this year. Since the 2015-9 capital plan, the New York MTA had been including the second phase of Second Avenue Subway in its capital plan, without a clear estimate of its projected cost. The rumors said the cost would be about $5 billion. A new media story finally gives an official cost estimate: $6 billion. The total length of the project, from 96th Street and 2nd Avenue to 125th Street and Lexington, is about 2.7 km. At $2.2 billion per km, this sets a new world record for subway construction costs, breaking that of the first phase of the same line, which only cost $1.7 billion per km. See a compendium of past posts here to look how these projects stack up. For people not interested in combing through multiple old posts of mine, the short version is that outside the Anglosphere, subway tunnels typically cost $100-300 million per km, with outliers in both directions, but even inside the Anglosphere, costs are in the mid-to-high hundreds of million per km. In some way, the high cost of SAS phase 2 is more frustrating than that of phase 1. This is because 1 km of the 2.7 km of route preexists. SAS construction began in the 1970s, but was halted due to New York’s financial crisis. In East Harlem, some actual tunnel segments were dug, roughly between the proposed station locations at 96th, 106th, 116th, and 125th Streets; Wikipedia has a more detailed list. Construction of phase 2 thus involves just the stations, plus a short bored segment under 125th Street to get from Second Avenue to Lexington, for a connection to the 4, 5, and 6 trains. Not having to build tunnels between the stations is beneficial, not as a cost saver in itself but as a way to reduce station costs. In phase 1, it appears that most costs were associated with the stations themselves; if I remember correctly, the cost breakdown was 25% for each of three new stations, and 25% for the tunnels in between. The reason is that the stations are quite deep, while the tunneling in between is bored, to reduce surface disruption. Deep stations are more expensive because they require more excavation, while tunnel boring costs depend more on soil type and how much infrastructure is in the way than on depth. Counting the extra expense of stations, bored subways cost more per km than cut-and-cover subways, but create less surface disruption away from station sites, which is why this method was chosen for phase 1. In contrast, in phase 2, most construction is stations, which would favor a shallow cut-and-cover solution. Unfortunately, according to rumors, it appears that the MTA now judges it impossible to use the preexisting tunnels in phase 2. If this is true, then this would explain the higher cost (though it would justify $400 million per km, not $2.2 billion): they’d have to build underneath those tunnels. But if this is true then it suggests severe incompetence in the planning stage, of the kind that should get senior employees fired and consultants blacklisted. The reason is that Second Avenue Subway was planned as a single line. The Environmental Impact Statement was for the full line, including the proposed construction techniques. The phasing was agreed on by then; there was only enough state money for phase 1. This isn’t an unexpected change of plans. I’d understand if in the 2000s it was found that tunnels from the 1970s were not usable; this happened further south, in phase 4, where a preexisting tunnel under Chrystie Street was found to be difficult to use. But in the 2000s the SAS studies signed off on using the tunnels in Harlem, and what seems to be happening is that phase 1, built according to the specifications of the same study, is too deep for using the tunnels. At $6 billion, this line shouldn’t be built. I know that it goes to a low-income, underserved neighborhood, one that I’ve attacked New York before for taking years to equip with bike lanes (scroll down to my comments here). But the ridership projection is 100,000 per weekday, and $60,000 per weekday rider is too much. Phase 1, providing an underrated east-west connection and serving a denser neighborhood, is projected to get 200,000, for a projection of around $25,000 per weekday rider, which isn’t terrible, so it’s a justified project even if the costs could be an order of magnitude lower. Were costs lower, it would be possible to build subways to many more low-income neighborhoods in New York. A 125th Street crosstown line, extending phase 2 of SAS, would provide Harlem with crucial east-west connectivity. Subways under Nostrand and Utica Avenues would serve a mixture of working- and middle-class neighborhoods in Brooklyn. A subway under Northern Boulevard in Queens, connecting to phases 3 and 4 of SAS, would serve one of the poorest parts of Queens. 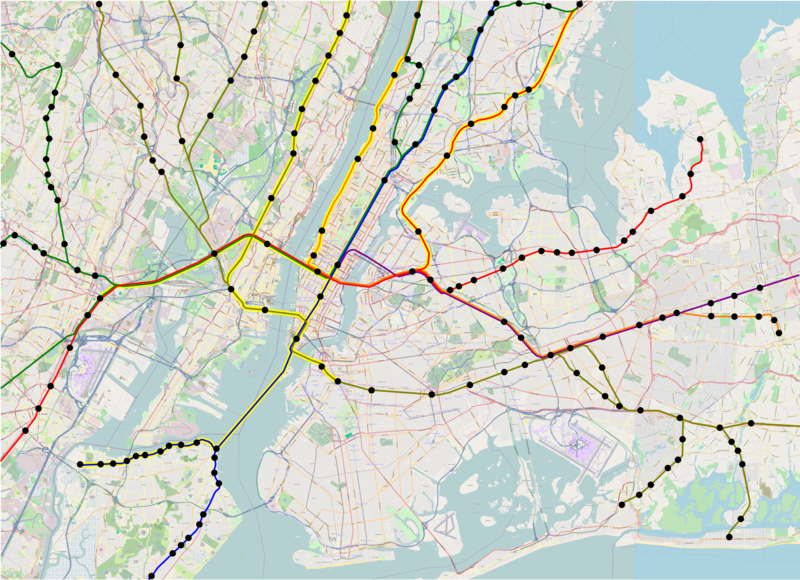 A network of tramways would improve surface transit in the South Bronx. Triboro Line would connect poor areas like the South Bronx and East New York with richer ones like Astoria. New York could achieve a lot, especially for its most vulnerable residents, if it could construct subways affordably. But in a world in which subways cost $60,000 per weekday rider and $2.2 billion per km, New York cannot extend the subway. If it has money in its budget for investment, it should look into things other than transportation, such as social housing or schools. Or it could not borrow money at all to pay for big projects, and in lieu of the money spent on interest, reduce taxes, or increase ongoing social spending. Given persistent high costs, I would recommend shelving SAS and future rail extensions in New York, including the Gateway tunnel, until costs can be drastically cut. There’s no shortage of worthy priorities for scarce budget in New York, both city and state. Health care in the US is too expensive by a factor of 2, not 10, and transfer payments have near-100% efficiency no matter what; it’s possible to exhaust the tax capability of a state or city just on these two items. Perhaps the need to compete with other budget priorities would get the MTA to cut waste. In 2009, studies began for a replacement of the Baltimore and Potomac (B&P) Tunnel. This tunnel, located immediately west of Baltimore Penn Station, has sharp curves, limiting passenger trains to about 50 km/h today. The plan was a two-track passenger rail tunnel, called the Great Circle Tunnel since it would sweep a wide circular arc; see yellow line here. It would be about 3 kilometers and cost $750 million, on the high side for a tunnel with no stations, but nothing to get too outraged about. Since then, costs have mounted. In 2014, the plan, still for two tracks, was up to $1 billion to $1.5 billion. Since then, costs have exploded, and the new Final Environmental Impact Statement puts the project at $4 billion. This is worth getting outraged about; at this cost, even at half this cost, the tunnel should not be built. However, unlike in some other cases of high construction costs that I have criticized, here the problem is not high unit costs, but pure scope creep. The new scope should be deleted in order to reduce costs; as I will explain, the required capacity is well within the capability of two tracks. First, some background, summarized from the original report from 2009, which I can no longer find: Baltimore was a bottleneck of US rail transportation in the mid-19th century. In the Civil War, there was no route through the city; Union troops had to lug supplies across the city, fighting off mobs of Confederate sympathizers. This in turn is because Baltimore’s terrain is quite hilly, with no coastal plain to speak of: the only flat land on which a railroad could be easily built was already developed and urbanized by the time the railroad was invented. It took until the 1870s to build routes across the city, by which time the US already had a transcontinental railroad. Moreover, intense competition between the Pennsylvania Railroad (PRR) and the Baltimore and Ohio (B&O) ensured that each company would built its own tunnel. The two-track B&P is the PRR tunnel; there’s also a single-track freight tunnel, originally built by the B&O, now owned by CSX, into which the B&O later merged. Because of the duplication of routes and the difficult geography, the tunnels were not built to high standards. The ruling grade on the B&P is higher than freight railroads would like, 1.34% uphill departing the station, the steepest on the Northeast Corridor (NEC) south of Philadelphia. This grade also reduces initial acceleration for passenger trains. The tunnel also has multiple sharp curves, with the curve at the western portal limiting trains today to 30 mph (about 50 km/h). The CSX tunnel, called Howard Street Tunnel, has a grade as well. The B&P maintenance costs are high due to poor construction, but a shutdown for repairs is not possible as it is a key NEC link with no possible reroute. In 2009, the FRA’s plan was to bypass the B&P Tunnel with a two-track passenger rail tunnel, the Great Circle Tunnel. The tunnel would be a little longer than the B&P, but permit much higher speeds, around 160 km/h, saving Acela trains around 1.5 minutes. Actually the impact would be even higher, since near-terminal speed limits are a worse constraint for trains with higher initial acceleration; for high-performance trains, the saving is about 2-2.5 minutes. No accommodation was made for freight in the original plan: CSX indicated lack of interest in a joint passenger and freight rail tunnel. Besides, the NEC’s loading gauge is incompatible with double-stacked freight; accommodating such trains would require many small infrastructure upgrades, raising bridges, in addition to building a new tunnel. In contrast, the new plan accommodates freight. Thus, the plan is for four tracks, all built to support double-stacked freight. This is despite the fact that there is no service plan that requires such capacity. Nor can the rest of the NEC support double-stacked freight easily. Of note, Amtrak only plans on using this tunnel under scenarios of what it considers low or intermediate investment into high-speed rail. Under the high-investment scenario, the so-called Alternative 3 of NEC Future, the plan is to build a two-track tunnel under Downtown Baltimore, dedicated to high-speed trains. Thus, the ultimate plan is really for six tracks. Moreover, as pointed out by Elizabeth Alexis of CARRD, a Californian advocacy group that has criticized California’s own high-speed rail cost overruns, the new tunnel is planned to accommodate diesel trains. This is because since 2009, the commuter rail line connecting Baltimore and Washington on the NEC, called the MARC Penn Line, has deelectrified. The route is entirely electrified, and MARC used to run electric trains on it. However, in the last few years MARC deelectrified. There are conflicting rumors as to why: MARC used the pool of Amtrak electric locomotives, and Amtrak is stopping maintaining them as it is getting new locomotives; Amtrak is overcharging MARC on electricity; MARC wants fleet compatibility with its two other lines, which are unelectrified (although the Penn Line has more ridership than both other lines combined). No matter what, MARC should immediately reverse course and buy new electric trains to use on the Penn Line. Freight trains are more complicated – all US freight trains are dieselized, even under catenary, because of a combination of unelectrified yards and Amtrak’s overcharging on electric rates. However, if freight through the Great Circle Tunnel is desired, Amtrak should work with Norfolk Southern on setting up an electric district, or else Norfolk Southern should negotiate trackage rights on CSX’s existing tunnel. If more freight capacity is desired, private companies NS and CSX can spend their own money on freight tunnels. In contrast, a realistic scenario would ignore freight entirely, and put intercity and regional trains in the same two-track tunnel. The maximum capacity of a two-track high-speed rail line is 12 trains per hour. Near Baltimore Penn the line would not be high-speed, so capacity is defined by the limit of a normal line, which is about 24 tph. If there is a service plan under which the MARC Penn Line could get more than 12 tph at the peak, I have not seen it. The plans I have seen call for 4 peak tph and 2 off-peak tph. There is a throwaway line about “transit-like” service on page 17, but it’s not clear what is meant in terms of frequency. Regardless of what the state of Maryland thinks MARC could support, 12 peak regional tph through Baltimore is not a reasonable assumption in any scenario in which cars remain legal. The tunnels are not planned to have any stations, so the only city station west of Baltimore Penn is West Baltimore. Baltimore is not a very dense city, nor is West Baltimore, most famous for being the location of The Wire, a hot location for transit-oriented development. Most of Baltimore’s suburbs on the Penn Line are very low-density. In any scenario in which high-speed rail actually fills 12 tph, many would be long-range commuters, which means people who live in Baltimore and work in Washington would be commuting on high-speed trains and not on regional trains. About the upper limit of what I can see for the Penn Line in a realistic scenario is 6 tph peak, 3-4 tph off-peak. Moreover, there is no real need to separate high-speed and regional trains for reasons of speed. High-speed trains take time to accelerate from a stop at Baltimore: by the portal, even high-acceleration sets could not go much faster than 200 km/h. An in-tunnel speed limit in the 160-180 km/h area only slows down high-speed trains by a few seconds. Nor does it lead to any noticeable speed difference with electrified regional trains, which would reduce capacity: modern regional trains like the FLIRT accelerate to 160 km/h as fast as the fastest-accelerating high-speed train, the N700-I, both having an acceleration penalty of about 25 seconds. The upshot is that there is no need for any of the new scope added since 2009. There is no need for four tracks; two will suffice. There is no need to design for double-stacked freight; the rest of the line only accommodates single-stacked freight, and the NEC has little freight traffic anyway. Under no circumstances should diesel passenger trains be allowed under the catenary, not when the Penn Line is entirely electrified. The new tunnel has no reason to cost $4 billion. Slashing the number of tunnels from four to two should halve the cost, and reducing the tunnels’ size and ventilation needs should substantially reduce cost as well. With the potential time gained by intercity and regional trains and the reduced maintenance cost, the original budget of $750 million is acceptable, and even slightly higher costs can be justified. However, again because the existing two-track capacity can accommodate any passenger rail volume that can be reasonably expected, the new tunnel is not a must-have. $4 billion is too high a cost, and good transit activists should reject the current plan. I have written many posts about international differences in subway construction costs. They’ve gotten a lot of media attention, percolating even to politicians and to a team of academics. Against this positive attention, there have been criticisms. Three come to mind: the numbers are incorrect, costs do not matter, and the comparisons are apples-and-oranges. The first criticism depends entirely on whether one disbelieves figures given in high-quality trade publications, government websites, and mass media. The second criticism I addressed at the beginning of the year, comparing the extent of subway construction in Sweden and the US. Today, after hearing people invoke the third criticism on social media to defend Ed Glaeser’s remark that it’s possible to cut US construction costs by 10% but not 75%, I want to explain why the comparisons I make do in fact involve similar projects. Some of the specific criticisms that I’m comparing apples and oranges are pure excuses, borne out of ignorance of how difficult certain peer subway tunneling projects have been. First, let us go back to my first post on the subject: I was comparing New York, where I was living at the time, with Tokyo, Seoul, Singapore, London, Paris, Berlin, Amsterdam, Copenhagen, Zurich, Madrid, Milan, Barcelona, and Naples – all well-known global cities. Going even farther back, before I started this blog in 2011, I first saw the difference between New York and Tokyo in 2008 or 2009, and then looked up figures for London, Paris, and Berlin in late 2009. I was focusing on infill projects in the biggest cities in the first world, specifically to preempt claims that New York is inherently more expensive because it’s bigger and richer than (say) Prague. Until I started looking at third-world construction costs, I thought they’d be lower; see for example what I wrote on the subject in 2009 here. I bring this history up to point out that at first, I was exceptionally careful to pick projects that would pass any exceptionalist criticism portraying New York or the US in general as harder to build in. With a more complete dataset, it’s possible to rebut most of the big criticisms one could make under the apples-and-oranges umbrella. Labor costs are of course high in New York, but also in many of the other cities on my list. The best comparable sources I can find for income in the US and Europe cite income from work (or total income net of rent and interest): see here for US data and look under “net earnings,” and here for EU data. Ile-de-France is about as rich as metro New York, and London and Stockholm are only slightly poorer, all after PPP adjustment. Moreover, within countries, there’s no obvious relationship between income and construction costs. The US is somewhat of an exception – Los Angeles appears to have the cheapest subways, and is also the poorest of the major cities – but elsewhere, this effect is muted or even reversed. The factor-of-2 difference in income between Lombardy and Campania has not led to any construction cost difference between Milan and Naples. In France, a comparative analysis of tramway costs, showing some but not all lines, fails to find significant differences between Paris and many provincial cities, with far lower regional incomes; moreover, this list omits Lyon, the richest provincial city, where the line for which I can find reliable cost data would be squarely in the middle of the national list in cost per km. Finally, between countries, the correlation between construction cost and wealth seems weak when one excludes the US. My analysis of this is a subjective impression from looking at many case studies; David Schleicher and Tracy Gordon, formally analyzing a dataset with a large overlap with mine, find a positive but weak correlation. PPP-adjusted costs tend to be much more consistent across countries of varying income levels than GDP-adjusted costs; the latter statistic would exhibit a vast gap between the construction costs of much of Europe and those of high-cost poor countries like India and Bangladesh, the former statistic would show them to be not too different. What is true is that New York specifically seems to have labor regulations that reduce productivity. Little of this is in citable, reputable sources, but comes from quotes given to me from people involved in the industry. One example given by Michael Horodniceanu, president of MTA Capital Construction, is of a certain task involving tunnel-boring machines, which is done by 9 people in Madrid and 24 in New York. However, there’s a chasm between the claim that the US is more expensive because it pays first-world wages and the claim that there are specific labor regulations in the US in general or New York in particular that raise construction costs. The latter claim is if anything optimistic, since it suggests it is possible to improve labor productivity with rule changes and automation. People whose only experience with major infrastructure projects outside the US is reading about China think that the US has a NIMBY-prone process, driving up land acquisition costs. Too many proponents of high-speed rail think that it should go in freeway medians to save on such costs; Hyperloop proponents even claim that the proposed system’s fully elevated nature is a plus since it reduces land footprint. The reality is the exact opposite. In Japan, as Walter Hook explains in a Transportation Research Board paper from 1994, urban landowners enjoy strong property rights protections. This drives up the cost of construction: land acquisition is 75-80% of highway construction cost in Japan, compared with 25% in the US; for rail, both sets of numbers are lower, as it requires narrower rights-of-way than highways. In Japan, acquiring buildings for eminent domain is also quite difficult, unlike in the US. Tokyo is toward the upper end of rail construction costs outside the Anglosphere, and the smaller cities in Japan seem to be at best in the middle, whereas the Shinkansen’s construction cost seems relatively low for how much tunneling is required. In the last twenty years, land prices have increased in the US cities that build the most subways, including New York, San Francisco, and Los Angeles. However, Second Avenue Subway had few demolitions, for ventilation rather than carving a right-of-way. New York and other North American cities benefit from having wide arterial streets to dig subways under; such streets aren’t always available in Europe and Japan. 1. While New York is very dense, there exist other cities that are about equally dense. Paris has the same residential density as Manhattan, both around 26,000 people per km^2. The wards of Tokyo where infill subways are built are less dense, but not by much: Toshima, Shinjuku, and Shibuya, where the Fukutoshin Line passes, are collectively at 18,500/km^2. Athens proper has about 17,000/km^2, and most of the under-construction Line 4 is in the city proper, not the suburbs. Barcelona has 16,000/km^2. Paris, Athens, and Barcelona do not appear to have much higher construction costs than lower-density Continental cities like the cities of Germany or Scandinavia. 2. Suburban subway extensions in the US are quite expensive as well. The projected cost of BART to San Jose is around $500 million per underground km; Boston’s Green Line Extension, in a trench next to a mainline railroad, is currently around $400 million, so expensive it was mistakenly classified as a subway in a Spanish analysis (PDF p. 34) even before the latest cost overrun; Washington’s Silver Line, predominantly in a suburban freeway median, with little tunneling, is around $180 million per km. It is to be expected that a suburban subway, let alone a suburban light rail line, should be cheaper than city-center infill; what is not to be expected is that an American suburban light rail line should cost more than most infill subways in Europe. 3. Density by itself does not raise construction costs, except through its effects on the built form and on land costs. Land costs, as described in the previous section, are not a major factor in US construction costs. Built form is, but Second Avenue Subway passes under a wide arterial street, limiting not only takings but also the quantity of older infrastructure to cross. Tunnels that cross under entire older subway networks, such as Tokyo’s Fukutoshin and Oedo Lines, Paris Metro Line 14 and the extension of the RER E to the west, Barcelona Lines 9 and 10, and London’s Crossrail and Jubilee Line Extension, naturally have higher construction costs; in some cases, it required careful design to thread these lines between older tunnels, with only a few centimeters’ worth of clearance. The 7 extension has no more difficult construction than those lines, and Second Avenue Subway is if anything easier. Even the future phase 3, crossing many east-west subways in Midtown, mostly involves overcrossings, as those east-west subways are quite deep at Second Avenue to go under the East River. People who defend New York’s high construction costs as reasonable or necessary like to point out geological difficulties; I recall seeing a few years ago a reference to an archeological site in Harlem as evidence that New York has unique difficulties. As with the other excuses, these problems are far less unique than New Yorkers think, and in this case, New York is actually much easier than certain other cases. The point here is that the presence of urban archeology is indeed a massive cost raiser. In cities with significant preindustrial cores, lines passing through old sites have had to be built delicately to avoid destroying artifacts. For examples, consider Marmaray in Istanbul, Rome Metro Line C, and multiple lines in Athens and Mexico City. While Turkish construction costs are generally low, Marmaray was about $400 million per km, and a project manager overseeing construction said, “I can’t think of any challenge this project lacks.” Rome Metro Line C has been plagued with delays and is around twice as expensive per km as recent lines in Milan and Naples. In Paris, Metro 14 ran into medieval mines at its southern extremity during construction, leading to a cave-in at a kindergarten; a suburban extension of Metro 4 required some work on the mines as well. Such artifacts exist in New York, but generally only at its southern end, which was settled first. The Upper East Side urbanized in the late 19th century. It does not have the layers of fragile artifacts that cities that were already large in the Middle Ages were, let alone cities from Antiquity like Rome and Byzantium. Against this, there is the real fact that Manhattan’s rock is schist, which is hard to tunnel through since its quality is inconsistent (see e.g. brief explanation in a New York Times article from 2012). The rock itself is not too different from the granite and gneiss of Stockholm, but is at times more brittle, requiring more reinforcement; contrary to what appears to be popular belief, the problem isn’t that schist is hard (gneiss is even harder), but that it is at times brittle. That said, by the standards of medieval Parisian mines and Roman ruins, this does not seem like an unusual imposition. What’s more, phase 2 of Second Avenue Subway appears to be in Inwood marble rather than Manhattan schist, and yet the projected construction costs per km appear to be even higher; the rumors I have seen on social media peg it at $5 billion for about 2.7 km, of which about 1 km preexists. The sharp-eyed reader will notice that with the possible exception of Paris Metro 14, the projects I am positively comparing to American subways are only discussed in one or two of the four above items – labor costs, land costs, density, and geology and archeology. It’s always possible to excuse a particular high-cost line by finding some item on which it differs from other lines. There aren’t a lot of subway lines under construction in the world right now, complicating any attempt at a large-N study. David Schleicher and Tracy Gordon have looked at a few possible correlates, including GDP per capita, corruption perception, and whether the country uses English common law, but there aren’t enough datapoints for a robust multivariate analysis, only for univariate analyses one correlate at a time. Were the cost difference smaller, I might even be inclined to believe these excuses. Perhaps New York really does have a unique combination of high density, high wages, difficult rock, and so on. If Second Avenue Subway cost $500 million per km, and if above-ground rail lines elsewhere in the US cost like above-ground rail lines in the rest of the developed world, I would at most hesitantly suggest that there might be a problem in forums with plenty of experts who could give plausible explanations. But the actual cost of subways in New York is $1.5 billion per km, and proposed future lines go even higher; meanwhile, multiple at-grade and elevated US lines cost 5-10 times as high as European counterparts. That New York specifically has a factor-of-10 difference with cities that share most of its construction difficulties suggests that there really is a large problem of waste. New Yorkers tend to think that New York is special. This is not true of the denizens of every city, though London and Paris both seem to share New York’s pathology. The result is that many New Yorkers tend to discount such cross-city comparisons; who am I to put New York on the same list as lesser cities like Stockholm and Barcelona? I was affected by this mentality enough to begin my comparisons with the few cities New York could not denigrate so well. But with further investigation of what makes some subway tunnels more difficult than others, we can dispense with this chauvinism and directly discuss commonalities and differences between various cities. That is, those of us who care about good transit can have this discussion; the rest can keep their excuses.